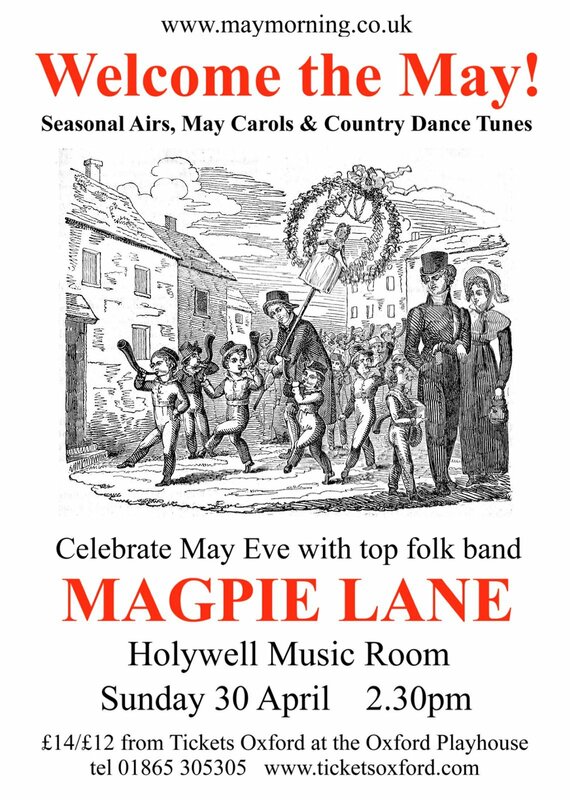 This afternoon and evening I’ll be playing with Magpie Lane at our annual Christmas concerts in the Holywell Music Room in Oxford. 25 years ago, when the first Magpie Lane Christmas gigs took place, I was actually in the audience as my wife was very heavily pregnant (our son Tom was in fact born a few days later on Christmas Day – hence my tune ‘The Christmas Baby’ which appeared on our Wassail CD). But I enjoyed watching that gig, and have never failed to enjoy playing at the Holywell over the succeeding years – in fact it’s one of the highlights of my year. The first Magpie Lane CD, The Oxford Ramble, was released in April 1993 and the band’s very first public appearance came a couple of weeks later. And we’ve just released our tenth album, which celebrates not only the band’s twenty-fifth anniversary, but also those 25 years of Christmas concerts at the Holywell. 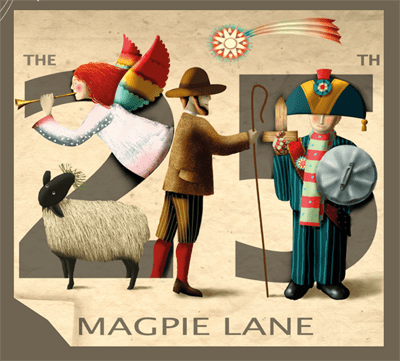 Cover of Magpie Lane CD The 25th. Cover illustration by founder member Tom Bower. Like Wassail (1995) and Knock at the Knocker, Ring at the Bell (2006) the new album features songs and tunes suitable for Winter and the Christmas season. Many are carols drawn from English sources – from the West Gallery era, from the notebooks of the early twentieth century collectors, or from the vibrant living carolling tradition of South Yorkshire. As you’ll see below, live versions of several of these carols have featured on this blog over the last few years (but of course these new studio recordings are much better!). The earliest piece on the album, ‘Angelus ad Virginem’, is from the thirteenth century – and is performed in a way that acknowledges the original links between carolling and dancing. ‘In Winter Time’, on the other hand, composed by guitarist Jon Fletcher’s father, is a starkly beautiful carol which deserves to be ranked alongside the finest examples of twentieth century English carol compositions. There are also secular songs. Both George Wither’s seventeenth century ‘Christmas Caroll’ and Pete Joshua’s modern ‘I am Christmas Time’ celebrate the good things about Christmas – eating, drinking, and having a good time with friends and family. The album is available to order now from the Magpie Lane website. Get an order in asap, and we’ll do our best to make sure your copy arrives before Christmas. Do you really want to subscribe to A Folk Song A Day? Anyway, if you’ve received a notification about this blog post, you must have opted to subscribe at some point over the last seven years. I’m very gratified that a good many people have done so. I don’t post many songs these days, but there’s still quite a few I’ve got up my sleeve, and one day they’ll make it up onto this site – and if you’re a subscriber you’ll be instantly notified when they do. But, as I’m sure you’re aware, you can unsubscribe at any time. The blog is hosted at WordPress.com which is owned by Auttomatic. They have a Privacy Notice describing the personal data that they collect about the users of WordPress sites. So, if you’re worried, have a read of that. The only information I can see about subscribers is your email address or WordPress presence, depending on how you subscribed. That’s all I need to say, I think. Do please carry on with whatever it was you were doing. Don’t look so worried! Everything’s fine. As noted in an earlier post, I first heard the song ‘Lord Franklin’ in the late seventies, and was immediately taken with it – and all the more so when I learned the story behind the song. I was therefore pleased to learn that the National Maritime Museum at Greenwich were to stage Death in the ice, a major exhibition about Franklin’s fateful final expedition. I visited the exhibition last week, and am happy to say that my expectations were fully met. It’s a very well presented exhibition which does a good job of presenting the background to Franklin’s expedition, details of his two ships and their crew, and details – insofar as they can be ascertained – of what befell them. Right at the start of the exhibition two massive video walls show projections of the Arctic landscape – to give you an idea of the environment Franklin and his men encountered (although inside, on a warm August day, the landscape looks beautiful – rather different if you were stuck in it in an Arctic winter, with insufficient food, and clothing which was not up to the job of keeping out the cold). Then we learn that the quest to discover the North West passage was a peculiarly British obsession, but also – thanks to successive expeditions approaching the route both from the Atlantic and from the Pacific in the East – that by 1845 when Franklin set sail, only 900 miles remained to be charted. I was particularly taken with a table-top projection which literally draws the map of North America and Canada, in accordance with the state of Europeans’ knowledge of the region as it developed over time, from John Cabot in 1497, through Frobisher, Cartier, Hudson, Cook (who charted practically the entire East coast), Ross, and many others. 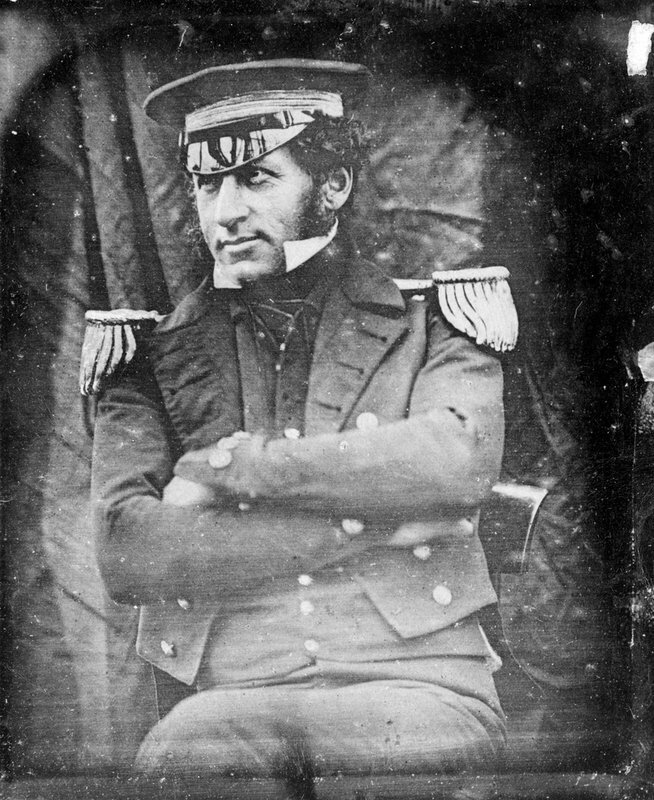 I was rather surprised to find – given the early date of the Franklin expedition – that there exist photographic images of Franklin himself, and several of his crew. 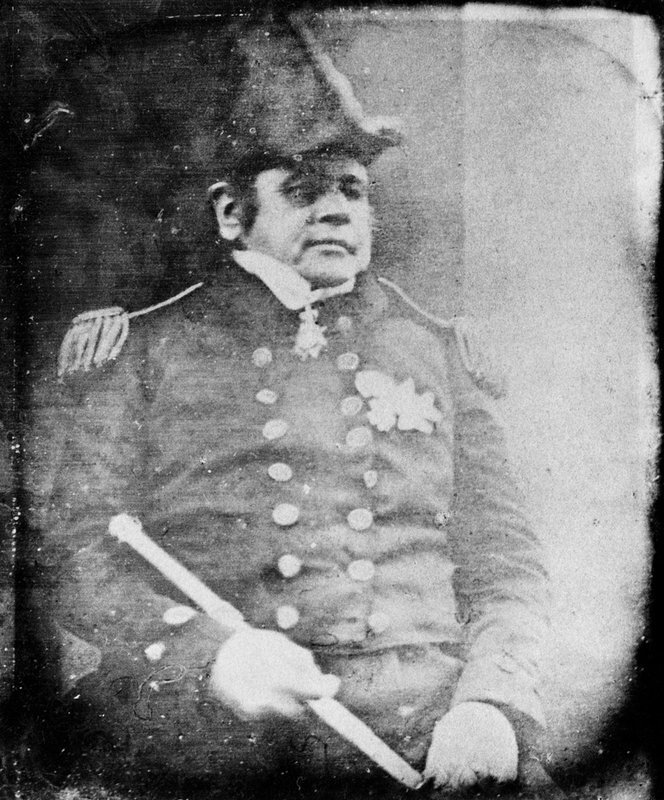 Sir John Franklin (1786-1847) – daguerrotype by Baird. Image copyright: National Maritime Museum, Greenwich, London. James Reid, Ice Master – daguerrotype by Baird. Image copyright: National Maritime Museum, Greenwich, London. 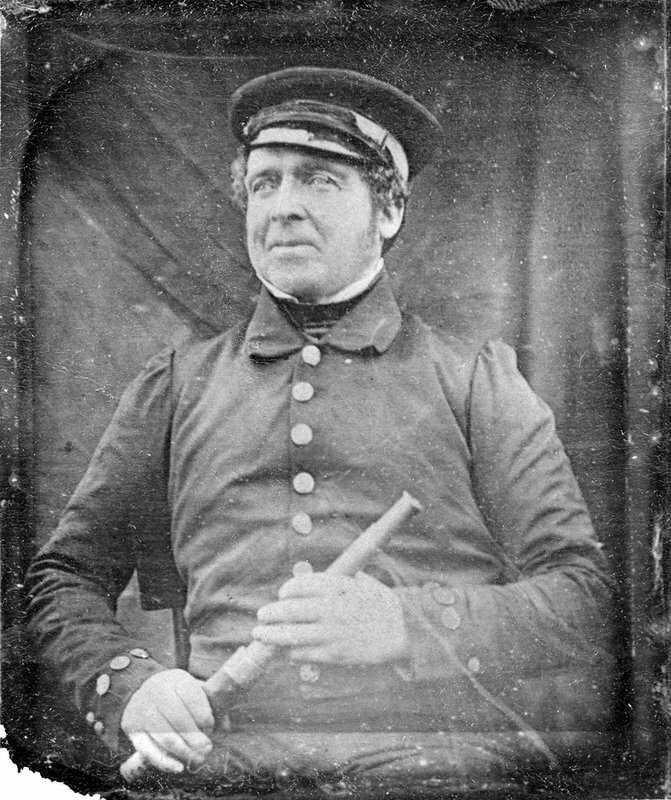 Lieutenant Graham Gore, Commander – daguerrotype by Baird. Image copyright: National Maritime Museum, Greenwich, London. I suppose Franklin’s status as a national hero, and the importance which the British government attached to his expedition, might account for these officers being photographed before setting off to the Arctic. (Franklin himself was already well-known to the British public as an intrepid explorer. He had earned the nickname “The man who ate his boots” when he ran into difficulties on an earlier expedition to the Arctic in 1819-1822. On that occasion some of his men died of starvation, while others were forced to eat lichen, and even tried to get sustenance by eating their own leather boots). It was the same factors, plus the indefatigable efforts of his widow Lady Jane Franklin, which ensured that several expeditions were sent out from 1848 onwards to try to discover the fate of her husband and crew. DR. RAE may be considered to have established, by the mute but solemn testimony of the relics he has brought home, that SIR JOHN FRANKLIN and his party are no more. But, there is one passage in his melancholy report, some examination into the probabilities and improbabilities of which, we hope will tend to the consolation of those who take the nearest and dearest interest in the fate of that unfortunate expedition, by leading to the conclusion that there is no reason whatever to believe, that any of its members prolonged their existence by the dreadful expedient of eating the bodies of their dead companions. Quite apart from the very loose and unreliable nature of the Esquimaux representations (on which it would be necessary to receive with great caution, even the commonest and most natural occurrence), we believe we shall show, that close analogy and the mass of experience are decidedly against the reception of any such statement, and that it is in highest degree improbable that such men as the officers and crews of the two lost ships would or could, in any extremity of hunger, alleviate the pains of starvation by this horrible means. If you’re interested, here’s Rae’s own account: The melancholy fate of Sir John Franklin and his party, as disclosed in Dr. Rae”s report; together with the despatches and letters of Captain M’Clure, and other officers employed in the Arctic expeditions (1854). My wife commented that the museum had made a good exhibition despite not having very much to display. A little harsh, but it’s true there’s not that many artefacts actually from the fateful last journey of the Erebus and Terror. And few of those artefacts can be identified as belonging to a specific member of the crew. 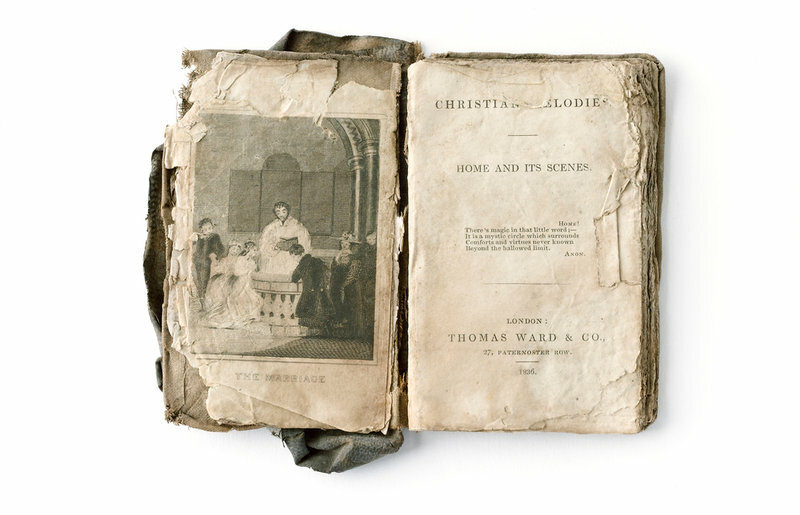 However amazingly, rather touchingly, Lieutenant Graham Gore’s battered personal copy of a hymnal – Christian Melodies published in 1836 by Thomas Ward and Co. – does survive, and is on display. Graham Gore’s copy of Christian Melodies. Image copyright: National Maritime Museum, Greenwich, London. That hymnal had in fact been discovered in May 1859 by the McClintock Search Expedition – one of the expeditions sent out to discover “the fate of Franklin”. But what makes this exhibition special is the fact that Franklin’s ship Erebus was only discovered in September 2014 – exactly three years ago today – so many of the objects on display here have never been seen in the UK before. I assume it was the discovery and examination of Erebus that prompted the current exhibition. And presumably the exhibition was in a fairly advanced stage of planning when Franklin’s second ship, Terror, was discovered just one year ago, on 3rd September 2016. No doubt as historians and archaeologists explore the evidence provided by this second wreck, we can look forward in future years to seeing more artefacts, and to reading new theories of what might have happened on that dreadful last journey. If you’re planning on visiting Greenwich, there’s plenty more of interest. Among the museum’s permanent exhibitions is one on the Britain and the Atlantic, particularly Britain’s role in the slave trade (a subject on which I don’t seem to have any songs in my repertoire. Time to learn ‘The Flying Cloud’ perhaps? ), and another on the East India Company (cue thoughts of ‘The East Indiaman’). And you can’t go to Greenwich without seeing the Old Royal Naval College, formerly the Royal Hospital for Seamen – where of course the hero of ‘On Board a Ninety-Eight’ spent his final days. A good day out. Ah, the merry month of May. This is another of those “here’s some I prepared earlier” blog posts, with songs celebrating the coming of May, or just where the action takes place in May. I’ll be singing some of these at an event in Canterbury on 13th May. This is part of TRYST, an exhibition organised by my artist friend Cathy Ward (I featured some of her fantastic hairscapes in Week 264 – Dowie Dens of Yarrow). 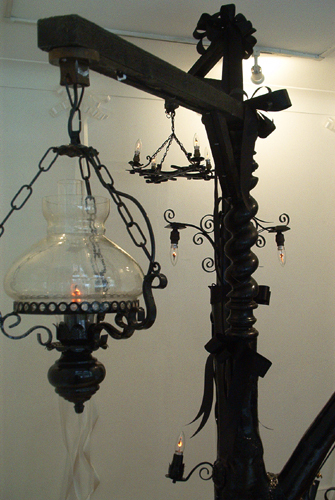 It takes place at Conquest House, one of the oldest buildings in Canterbury. Cathy and I have known each other literally all our lives and, having gone in very different directions in our teens, when we met again 15 or 20 years ago, found that we still had an awful lot in common – and that we both shared a love for English traditions. You’ll have seen corn dollies made by Cathy if you’ve watched Nick Abrahams’ video for Shirley Collins recent re-recording of ‘Death and the Lady’. Nick will also be taking part in the TRYST exhibition. 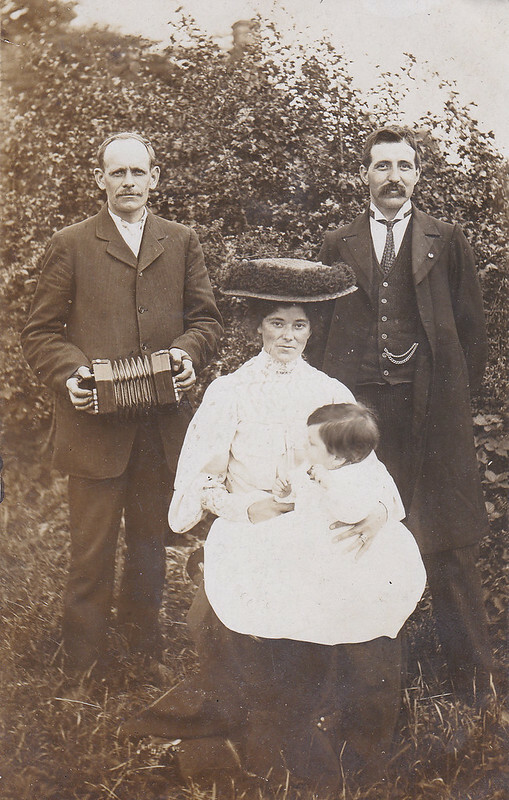 I’ll be singing, playing some tunes, and also showcasing some of the images from my parents’ collection of old postcards of morris dancers, maypoles, musicians, hop-picking and more – scanning the whole collection could take me years, but you can see several hundred already scanned at http://bit.ly/turnerpostcards. So, to get to the music. Let’s start with a couple of dance tunes to get us in the mood. 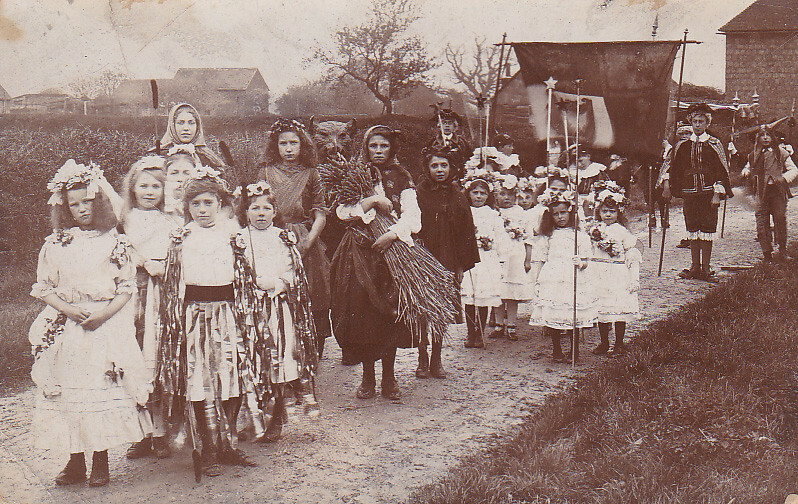 Great Chart May Day, Kent, early 1900s. Bridal, from Gathering in the May by Catheryne Ward and Eric Wright. But, in the starkest tale of all, a wealthy young woman meets with Death himself. And as Terry Pratchett fans will be very much aware THERE’S ONLY ONE WAY THIS CAN END. 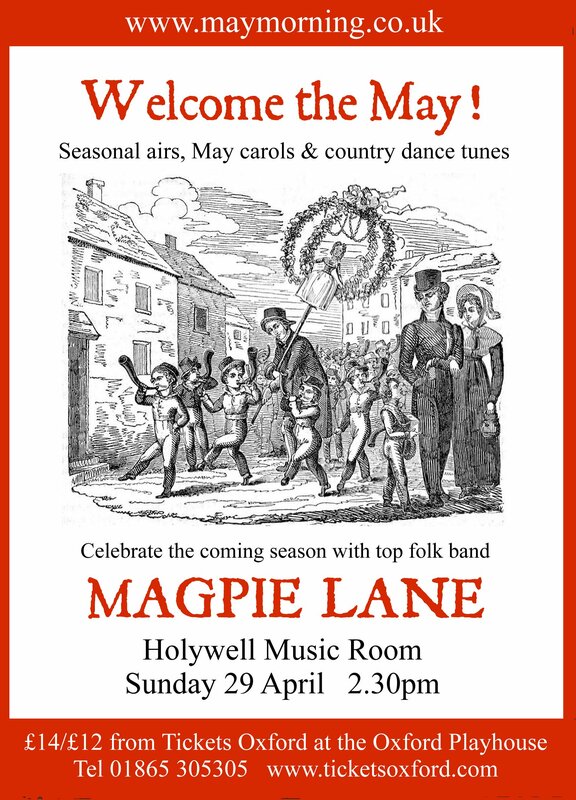 There’ll be a lot of Magpie Lane Maytime favourites, including Dave Webber’s May Song, the Swalcliffe May Day Carol, Martin Graebe’s Jack-in-the-Green, and tunes such as The First of May, Jack’s Alive and Round about the Maypole. When the band first started we always used to do concerts at Maytime, and are very pleased that Tim Healey has given us the opportunity to revive the tradition. In other news, we’re about to send off a series of 0s and 1s, and in return, in a few weeks’ time, we’ll be receiving 40 boxes of shiny silver discs – yes, the long-awaited new album, Three Quarter Time is very nearly here. You can sample some tracks from the new record at https://soundcloud.com/magpielane/sets/three-quarter-time – I hope you like them. I will of course let you know as soon as we have copies of the CD, and how you can get hold of one. Or, indeed, several. Well it is one week till Easter, and where I’m sitting, the morn is indeed very bright and clear. In stark contrast to the weather 4 years ago, when I first posted the Copper Family’s A Week Before Easter. In the absence of any new posts recently, here’s a Spring / Easter ‘playlist’ for you. Percy Manning. Image copyright Bodleian Library. 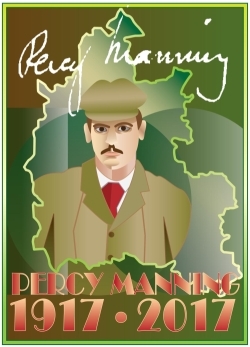 Percy Manning (1870-1917), “the man who collected Oxfordshire”, was a Victorian antiquary, archaeologist and folklorist. 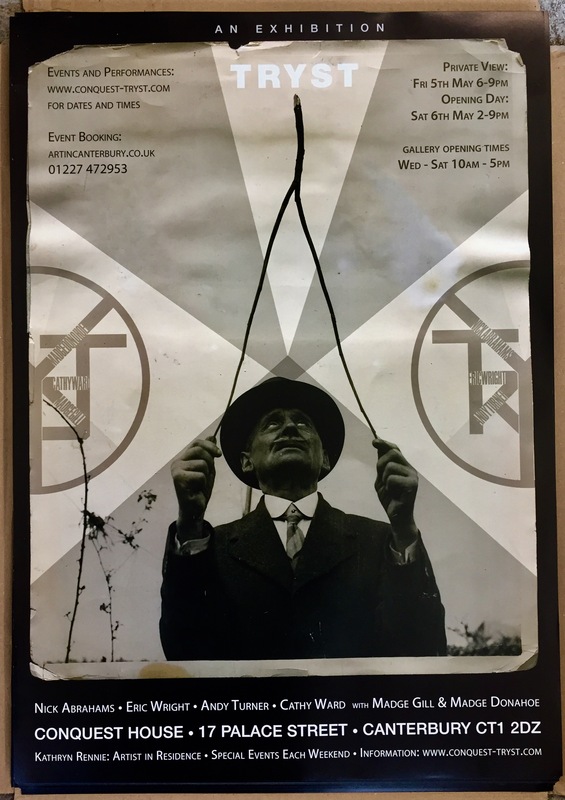 2017 is the centenary of his death, and to commemorate this, the morris historian Mike Heaney (formerly of the Bodleian Library, and founder member of Eynsham Morris) is coordinating a series of lectures, exhibitions and workshops taking place at locations including the Bodleian, the Pitt Rivers Museum, and the Bate Collection. Full details of all of these events can be found on the Folk in Oxford website. Among Percy Manning’s many interests was folk song and folk dance. 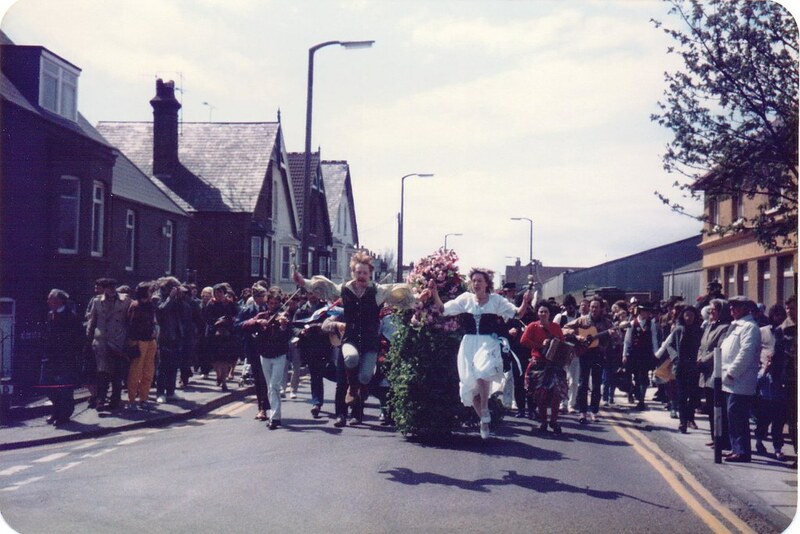 In 1899 he persuaded the Headington Quarry Morris Dancers, who had not been out dancing for several years, to revive the tradition. The occasion was a concert held at the Oxford Corn Exchange – now the Old Fire Station – at which the Morris dances alternated with folk songs, performed by various classically trained singers. We know exactly what songs and dances were performed, thanks to a report in Jackson’s Oxford Journal, 18th March 1899. Here’s a copy of the report from Jackson’s Oxford Journal. And on Friday 24th March Magpie Lane, together with the present Headington Quarry side, will be recreating that concert. Not with classically trained singers, with polite pianoforte accompaniment, but in our own style, with our own arrangements. Only one song in the programme (‘Twas early One Morning’ aka ‘All Jolly Fellows That Follow The Plough’) has previously featured in our repertoire, so this is an opportunity to hear a bunch of songs we’ve never performed before in public. William Chappell’s Popular music of the olden time (1859) – Volume 1 and Volume 2 available in full on the Internet Archive. 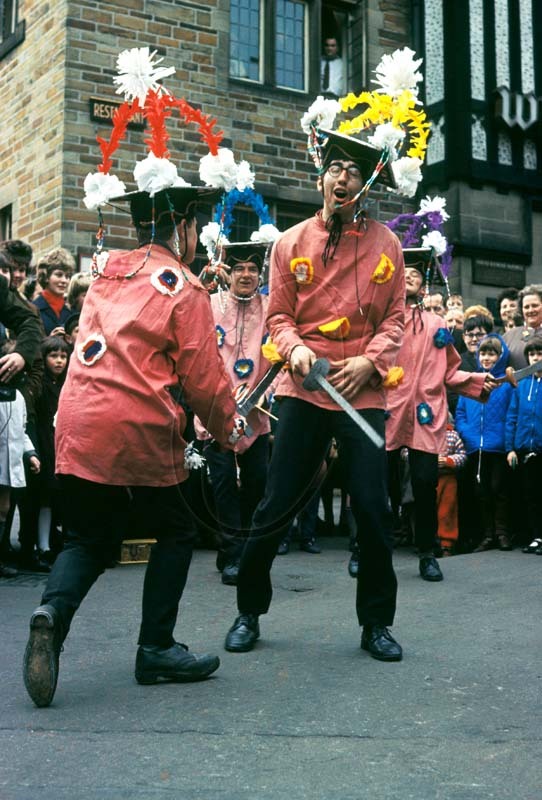 For anyone interested in morris dancing, and the history of the morris, this event is a must. 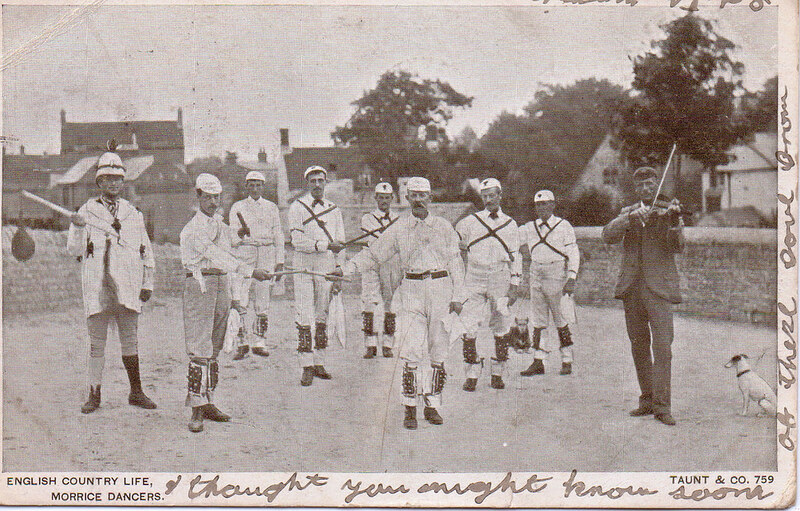 Had it not been for Manning’s concert, it is extremely unlikely that Headington Quarry would have been out dancing at Christmas 1899, when they bumped into Cecil Sharp – a meeting which is commonly held to have sparked the 20th century morris dance revival. So it’s a recreation of a historically important event, as well as (we hope) a thoroughly good evening’s entertainment. Friday 24th March 8 p.m. The work has been prompted – nay, forced on me – by Dropbox’s decision to discontinue their Public Folder feature. The MP3 files embedded in each week’s blog post are all stored in a Dropbox Public Folder. And, unless I do something about it, all of those audio files will stop working after March 15th this year. In fact, I’ve paid for a bit of extra web space, have copied the MP3 files to it, and yesterday started editing all of the existing links on the blog. It’s not difficult – just a tedious copy and paste job – but it will take me a while: I have to fix 274 links in all. When I’ve done that, I’ll have a look at fixing some of the broken images, which are quite common on the early blog posts. Mostly they’re broken because, since I started this blog in August 2011, the EFDSS Take Six Archive became the Full English, while the Bodleian’s Broadside archive is now Broadside Ballads Online. 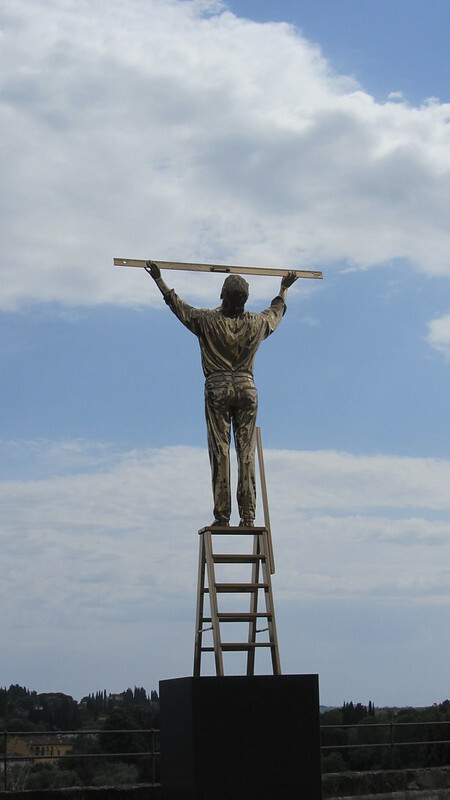 Those moves led to new URLs, so images being pulled in from the old sites no longer display. And then of course there are other sites which have been reorganised, and some, I suspect, that have just disappeared. Anyway I’m going to try to restore as much as I can. If you do find a page where the audio doesn’t work, or images are missing, or links are broken, do a leave a comment so I know to have a look.